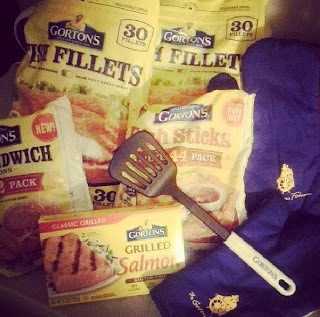 I LOVE to eat fish but I don't eat it as often as I used to and so when I got the chance to try out a variety of Gorton's Seafood products [for free, for this review] this week I jumped at the chance! I picked up several favorites like fish portions and fish sticks along with fish sandwich portions and GRILLED salmon! It is the grilled salmon that I would like to focus on this morning as most of you will be aware of the basics, but Gorton's grilled products are something else! The salmon came in a small box with 2 fillets and I popped them right out and followed the instructions to grill. I do love a good piece of salmon and I honestly wasn't too sure how these were going to taste when I first saw them as they were frozen into a block - once they were cooked, though, they looked delicious and my mouth is watering just thinking about it! Every single bite was light and tasteful, which is just as I expect salmon to be! I don't like my salmon overcooked and so I cook it to warm it all the way through but I never let it burn or get too crispy as this, for me, ruins the taste. Gorton's GRILLED salmon absolutely worked for me and tasted very fresh and looked extremely appealing once it was served up on my plate! I think anybody who loves their food fresh and grilled will love Gorton's grilled goodies, which come in a range consisting of salmon, tilapia, various grilled, flavored, fillets with garlic butter, lemon pepper and more - the varieties are vast and the taste is oh so good! To find out more about Gorton's and their range of foods, including the grilled options, take a look HERE! Also, why not enter the Gorton's Real Fabulous Sweepstakes, too!! If you like what you see, then why not follow Gorton's on Facebook and Twitter to keep up to date or just to say hey! How would you like to try some of Gorton's GRILLED products for yourselves!? Well, here is your chance! We are giving ONE winner TWO "FREE PRODUCT" coupons for the Gorton's products of their choosing PLUS a spatula, oven mitts AND recipe cards!! All you have to do is enter via the rafflecopter, below! Giveaway ends 02/01/14, must be a U.S resident and over 18. Mom's Gone Bronson is not responsible for prize fulfillment, thank you! Disclaimer: I received free product coupons in exchange for my thoughts on Gorton's products. My opinions are my own and honest. Your views may differ. Thank you! I'd love to try the fish fillets. The Salmon! I Love it! I like the fish fillets. I bake the whole box then put them on buns and freeze for a quick work lunch or bite to eat at the house. I love a good piece of salmon on a Caesar salad & always overlooked Gorton's. But now I think I need to try it! W love the grilled salmon and fish fillets. I'd like to try their Crispy Homestyle Shrimp! Shrimp scampi is my all-time fave.